Drum Corps in the Pacific Northwest is alive and well in 2008 despite the absence of the region's only World Class corps, Seattle Cascades, which chose to regroup this summer. 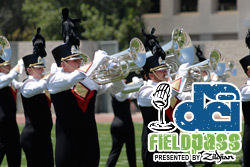 In fact, as Dan Potter and correspondent Mike Ferlazzo report in today's Field Pass presented by Zildjian, this has been a banner season for the northwest's Open Class corps. Download and listen. (MP3, 07:27, 6.83 MB) Subscribe to this podcast through iTunes. RSS feed. Field Pass archive.